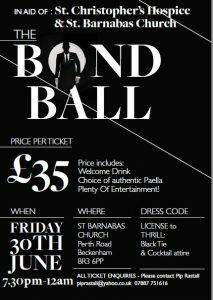 On Friday 30 June 2017 at 7.30pm, St Barnabas hosts The Bond Ball. Tickets are £35 per person, including a welcome drink, choice of paella and lots of entertainment! Dress code is Black Tie/Cocktail attire. All ticket enquiries to Pip Rastall, piprastall@yahoo.co.uk , telephone 07887 751616.